The Queen Mary 1 ship was planned and built as a response to the modern ocean liners constructed in Germany and launched in 1928 – SS Bremen and SS Europa. So the British “White Star Line” began its own ocean liner building program with “Oceanic” (construction started in 1928, but the ship was never finished due to the Great Depression of 1931), while the Cunard Line planned its own 75,000 ton liner. The construction of still the unnamed Cunard Queen Mary ship began in December 1930 (the ship’s keel was laid down on 31 January 1931) in the yard of “John Brown & Co” at Clydebank (Scotland). The launch was scheduled for May 1932, but the work on the ship was suspended in December 1931 due to the world economic depression. Then a loan of 9.5 million pounds from the British Government was granted to the Cunard Line with enough money to complete the Queen Mary ship and to build a second liner – the Queen Elizabeth ship. As a direct result of this most advantageous deal, the Cunard Line merged with its main UK rival “White Star” on 10 May 1934 into Cunard White Star Ltd. The Queen Mary construction resumed in April 1934, the liner was completed by August and launched on 26 September at a total cost of 3,5 million pounds sterling. Then the QM liner was taken to be fitted by the Bromsgrove Guild. The Queen Mary ship name was given when the new Cunard company received the King George V’s permission to name the liner after “the greatest queen of Britain” – Mary of Teck. The work was completed in March 1936. The Queen Mary ship sailed out for preliminary trials and after being painted in Southampton, the liner was handed over to Cunard White Star Line on 11 May 1936. 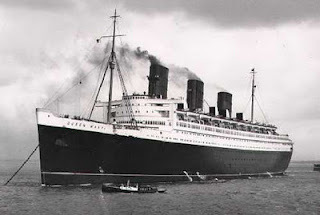 RMS Queen Mary ship first sailing was on 14 May with its Transatlantic itinerary being Southampton-Cherbourg-New York. By May 1937 the liner had carried a total of almost 57,000 passengers. And something about the Queen Mary ship – the fastest liner in the world. The main speed-rival of the QM ship was SS Normandie – a liner built in France (the Saint-Nazaire yards, launched 1932, scrapped 1946) and operated by the French Compagnie Generale Transatlantique line. The QM ship took the Blue Riband (the prestigeous award given to a ship with the speed record for a transatlantic crossing) from the French liner SS Normandie in August 1938, with record speeds for both west- and eastbound crossings of the Atlantic Ocean – the average speeds was, respectively, 30,63 kn (35m25 mph, 56,7 km/h) and 30,14 kn (34,68 mph, 55,82 km/h). In 1937, the Normandie liner was refitted with new propellers, enabling her to take the Blue Riband, but in 1938 the Queen Mary ship reclaim the honour for best speeds in both directions – westbound 30,99 kn (35,66 mph, 57.39 km/h) and eastbound 31,69 kn (36,47 mph, 58.69 km/h). This record was beaten by the SS United Sates liner in 1952. And as a fun fact – the ship Queen Mary had a shock proof compass – one of the world’s largest magnetic compasses at that time. (December 30, 1951, high-level diplomatic meetings aboard QM conducted by the Great Britain’s Prime Minister Sir Winston Churchill. Also onboard was the British wartime singer Vera Lynn (aka ‘Forces Sweetheart’). (December 5, 1952) fire incident (started in a cabin), followed by a dry-dock in Southampton. (December 9, 1967) she arrived in Long Beach CA – to stay! RMS Queen Mary 2 Ship (for now you can see here the QM2 cruise schedule with prices).